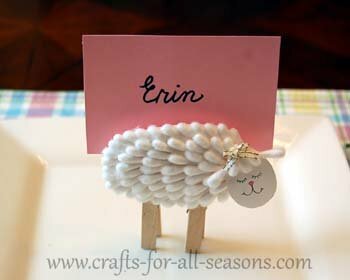 This lamb craft makes a cute Easter place name holder for your Easter party. The body is made out of cotton swabs, and the legs are made from two clothespins. 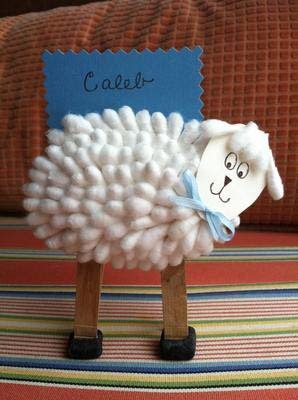 The clothespins can hold a name tag or a little note. 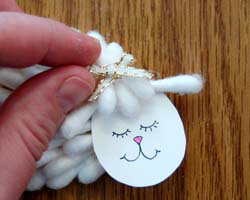 You can also just make the lamb's body and made paper legs, and then you can turn this Spring craft into a magnet, an embellishment for a fun Easter card. Would you like to see another craft using cotton swabs? 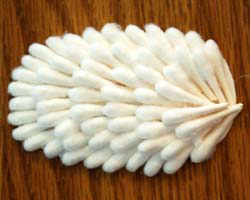 Be sure to see my Q-tip turkey for Thanksgiving! 1. Begin by clicking here to open up a PDF file of the patterns for the body and head (a new window will open, Adobe Reader required). Print this out on white card stock, and then cut out the patterns. 2. 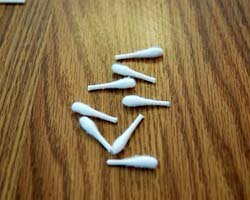 Next, cut off the heads of cotton swabs. 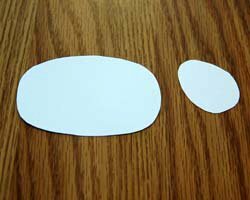 If a child is making this craft, be sure an adult does this part. 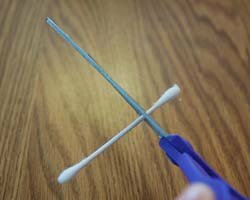 Make each cotton swab end about 1/2 inch long. 3. 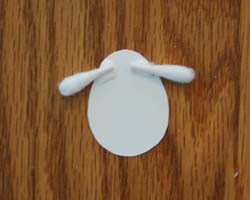 Begin gluing the cotton swab tips to the card stock body of the sheep, beginning at the back of the body. 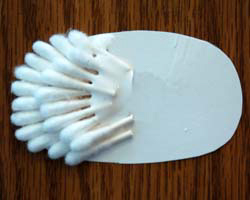 Then, layer more cotton swabs across the body. Use the photos below to guide you. 4. 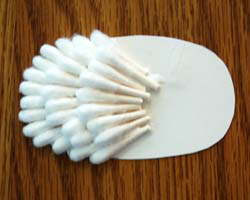 Next, glue two cotton swab tips to the side of the head to be the ears, as shown below. 5. 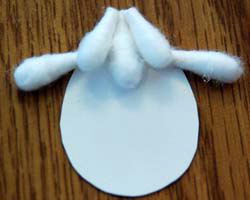 To make the lamb's "hair", cut three cotton swab tips off right at the head of the swab; they will be about 1/4 long. 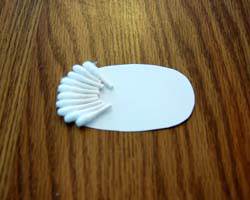 Layer and glue these to the top of the head as shown. 6. 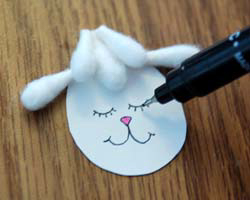 Use some markers to add on some cute facial features for the lamb. 7. Tie the ribbon in a small bow, and glue it to the top of the lamb's head. 8. 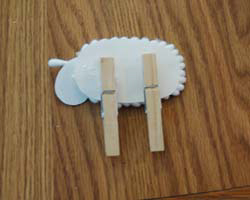 Glue two wooden clothespins to the back of the lamb's body. 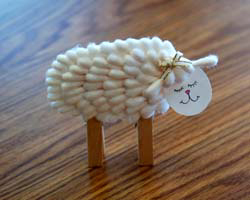 Check for balance and levelness when the glue is tacky, by standing the lamb up. Readjust the legs as necessary. Then allow them to dry completely. "I love this! I also did a boy version for the boys at our Easter table - just moved the hair bow down to make it a bow tie. Here is a photo (also shows the marshmallow hooves I added for balance)..."
Response from Crafts For All Seasons: How adorable!! Thank you for sharing a photo of your craft. 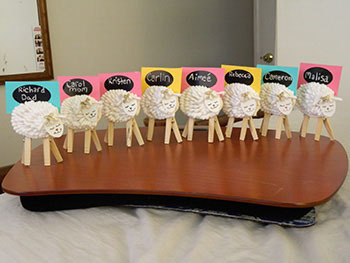 "Hello, I just completed your lamb craft for my whole family and I wanted to send you a photo of the finished product. It took awhile because I did the project alone, but everyone loved them. My mother says she will save them and pack them safely for next Easter." Response from Crafts For All Seasons: You did a fantastic job! Just love these!